My dearest Mikki, thank you for everything. I needed to love you every second. 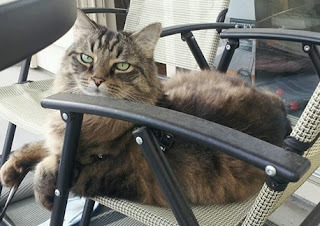 We met almost fourteen years ago when my Mom and I spotted a handsome cat lying down on a sidewalk in Port Coquitlam. It was meant to be. You helped me through all my break ups, you helped me through college, you were there when I first started to learn to drive, you were there when I got my first car, you were there when I would come home drunk in my early twenties and gracefully walked me to my bedroom, you were there whenever I was sick or upset. You witnessed all my milestones- Getting married, being a Mom for the first time, moving out, buying my first home, getting my second car. You always shared your opinion and talked back, made sure I didn’t forget to feed you or give you cuddles. When you got sick, my heart broke but I knew I must take care of you and get your better or comfortable just like always did for me. Your last gift to me was passing on your traits to your daughter kitten and making sure she watches over me and my last gift to you was making sure you left this earth in peace with family. I will never forget our time on the patio and all of our special moments. You may have left but your memory and spirit will live with me forever.